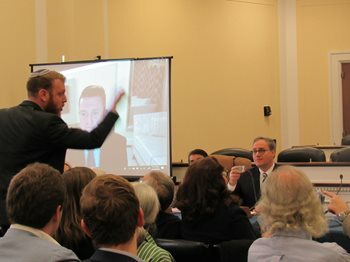 PHILADELPHIA — Nov. 15, 2018 – Three hooligans disrupted a Middle East Forum event in the Rayburn House Office Building in Washington, D.C. yesterday, hurling expletives and insults. The louts continued to scream for some ten minutes, preventing the event from resuming until the Capitol Police arrived and expelled them. The event, sponsored by Congressman Paul Gosar (Republican of Arizona) in cooperation with MEF, a Philadelphia-based think tank, focused on censorship and "de-platforming." This is the new trend of ostensibly non-political institutions - social media, Amazon, PayPal, O2, Hyatt Hotels, Norwegian Cruise Lines, Mastercard, among others - to deny service to conservatives or those who publicly discuss Islamism and related topics. As one participant in the event, UK activist Tommy Robinson, put it, "They are trying to de-platform an event on de-platforming." Robinson discussed PayPal having closed his account and the major impact this has had on the ability to convey his message. Rep. Paul Gosar opened the event with a warning that, "If you are not able to express your ideas on the common platforms, then you do not have free speech. If you are denied the ability to trade in the common marketplace, then you are not economically free - which is a prerequisite to political freedom." Raheem Kassam, a UK citizen, told about his being demonetized by YouTube, and the impact this had on his ability to do his work. Ezra Levant of Canada's Rebel Media explained how the forces of intolerance have bullied him in courtrooms and, most recently, with canceling two cruises he had planned for Rebel. Anne Marie Waters of the For Britain Party, told about her extensive difficulties in setting up a new party - simply opening a bank account or renting offices. "Under the pretense of standing up to 'Nazis' and 'Islamophobes,' the hoodlums tried to silence people from, among others, Jewish and Muslim backgrounds," said Daniel Pipes, MEF president and moderator of the event. "We waited out the disruption and resumed a successful discussion of an increasingly urgent issue. Suffice to say, the Forum will not be intimidated by thugs. But, sadly, we will make sure to have security close at hand at future public events."